Product prices and availability are accurate as of 2019-04-18 00:39:44 EDT and are subject to change. Any price and availability information displayed on http://www.amazon.com/ at the time of purchase will apply to the purchase of this product. 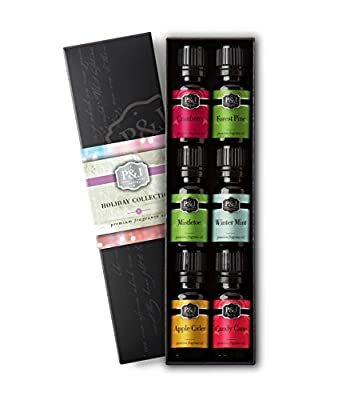 Our Holiday Set of Premium Fragrance Oils include 1 - 10ml bottle each of: Mistletoe, Candy Cane, Wintermint, Apple Cider, Cranberry, and Forest Pine aromas. These Fragrance Oils are recommended for use in home and car diffusion, or diluted in your candle, soap, bath, body or hair care formulations. This product is intended for cosmetic and home fragrance use only. DO NOT ingest. DO NOT use in lip balm/care formulations. Discontinue use if irritation occurs. Keep away from children and pets.